Lawrence of Arabia is a 1962 Breetish epic adventure drama film based on the life o T. E. Lawrence. It wis directit bi David Lean an produced bi Sam Spiegel throu his Breetish company, Horizon Pictures, wi the screenplay bi Robert Bolt an Michael Wilson. The film stars Peter O'Toole in the teetle role. It is widely considered ane o the greatest an maist influential films in the history o cinema. The dramatic score bi Maurice Jarre an the Super Panavision 70 cinematography bi Freddie Young are an aa heichly acclaimed. 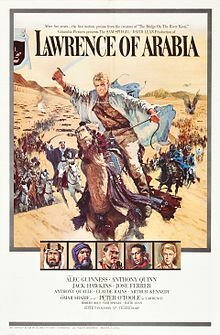 The film depicts Lawrence's experiences in Arabie durin Warld War I, in pairticular his attacks on Aqaba an Damascus an his involvement in the Arab Naitional Cooncil. Its themes include Lawrence's emotional struggles wi the personal violence inherent in war, his ain identity, an his dividit allegiance atween his native Breetain an its airmy an his newfoond comrades within the Arabian desert tribes. ↑ "LAWRENCE OF ARABIA (RESTORED VERSION) (PG)". British Board of Film Classification. 31 March 1989.